Wall Guards provide the first line of defense against everyday vehicular and pedestrian abuse in high-traffic areas and can dramatically reduce maintenance and repair expense over time. 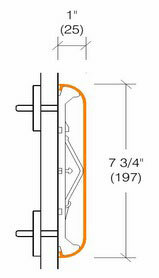 These W-8 guards are specifically designed for larger wall spaces and maximum impact protection against wheelchair, cart and furniture impacts. They also work with the new E-Clip wall guard retainer system that is a more environmentally friendly alternative to the continuous aluminum retainer. 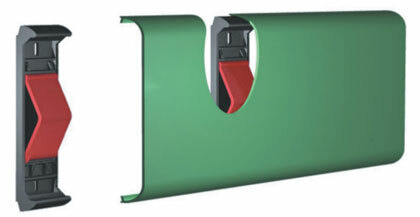 E-Clips save labor during installation and save money in both material and freight costs - 10 E-Clips are enough to install a twelve-foot length of wall guard and weigh only 12 ounces. 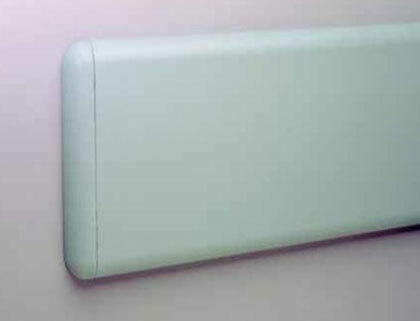 Wall guards are available in a wide range of colors to compliment virtually any decor, and comply with the most stringent regulatory requirements for flame resistance, and all vinyl rails are both chemical and stain resistant. 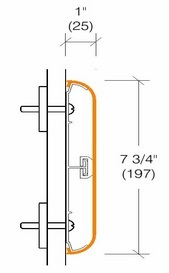 Material thickness: vinyl: .100" - aluminum: .080"
To order wall guards, please refer to the Color Chart, select your color preferences, and enter them in the form below. Both the W-8 aluminum retainer and W-8 e-clip wall guards are available for quick ship in Linen White (06), Champagne (07), Silver Gray (15), Eggshell (21), Windsor Blue (45) and Teal (49).